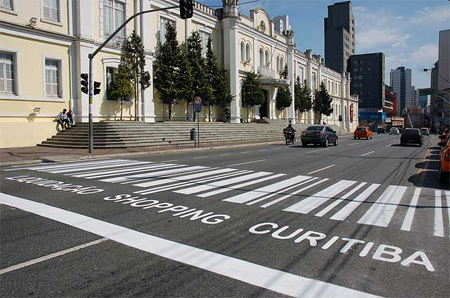 Creative uses of crosswalks in advertising campaigns by various companies. 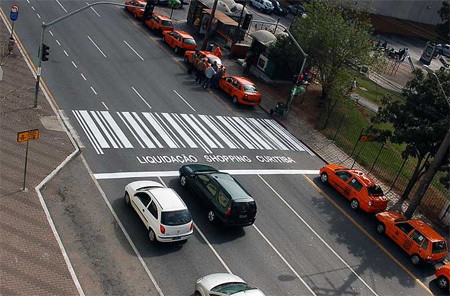 Creative zebra crossing that looks like a bar code was used to promote a sale at Curitiba shopping center in Brazil. 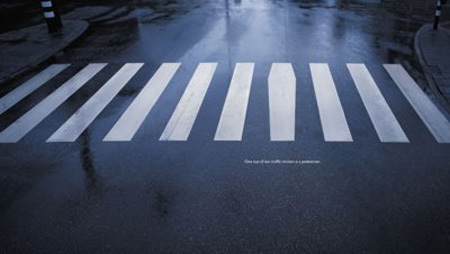 “Crosswalks are safer” by Pragma DDB, Lima, Peru. 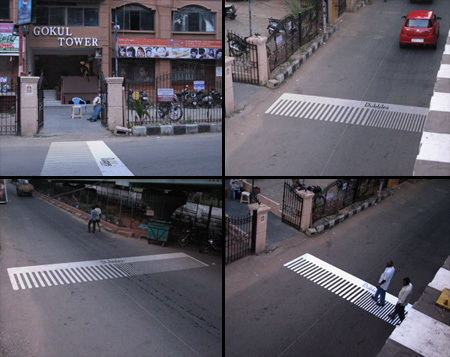 During the weekend, a comb-shaped zebra crossing was created adjacent to the hair salon in India. 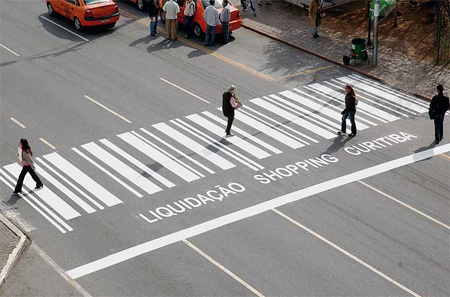 The effect was achieved by sticking a temporary transparent sticker to the road. 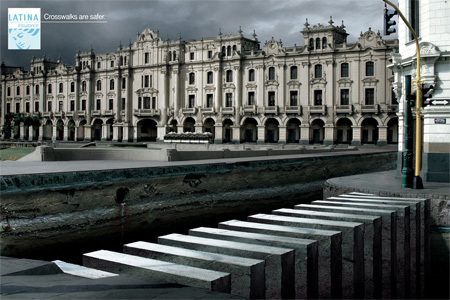 Clever marketing for South Africa Tourism. 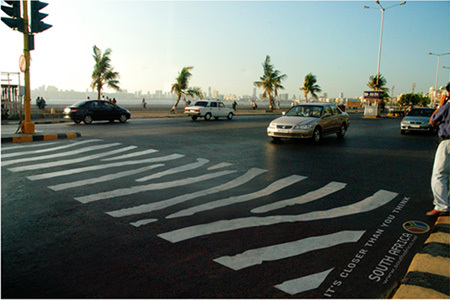 Zebra crossing signs in Mumbai, India were painted to look like the stripes of a real zebra. 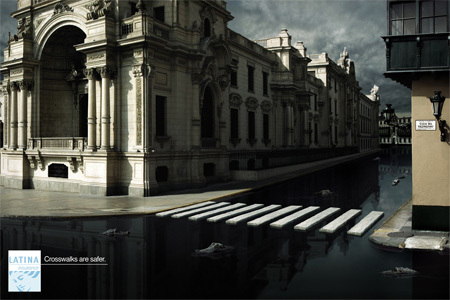 Clever marketing for Mr. Clean cleaning supplies in Italy. 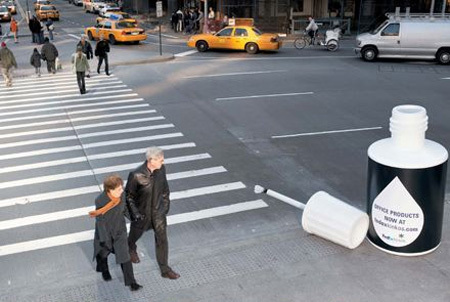 BBDO used oversized bottles of correction fluid to promote FedEx Kinko’s in New York. 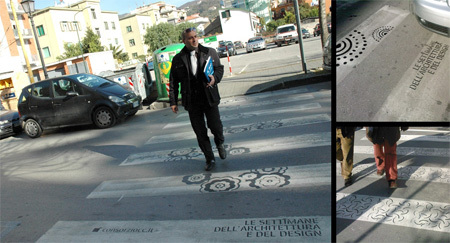 Zebra crossings were used to draw attention to the “Settimane dell’Architettura e del Design”, an international appointment between designers, architects and passionates in South Italy. 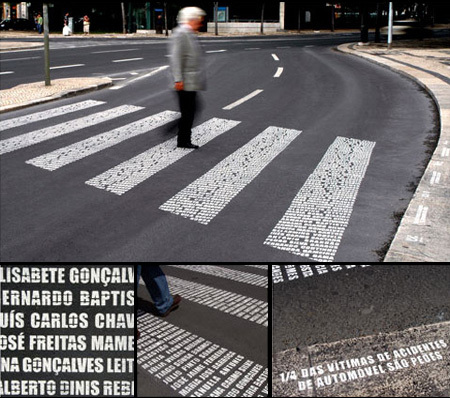 Names of victims of traffic accidents were painted as white stripes of zebra crossing. I could see myself not wanting to walk on the coffin shaped stripe for the funeral home for some reason. And…..wouldn’t the victims one actually be dangerous as people might read it ? Having said that, it does get the message across I guess. How do they keep the Mr. Clean crosswalk so white? :-?? neat collection. I myself prefer to walk on the wildside. Wow – sick! 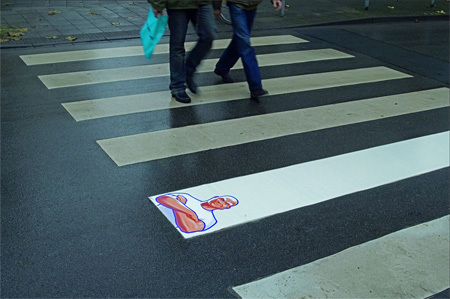 Mr. Clean Crosswalk is the best one in my opinion, excelent contrast. Amazing. I’m not sure but suppose that in Poland this kind of advertising is forbidden. What a pity! 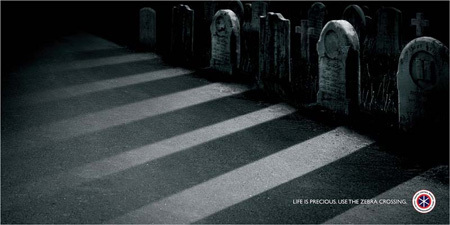 These are great, with the exception of the Zebra Crossing Memorial. I mean, don’t you find it Ironic that if people stand in the crosswalk, reading the memorial they just might be a victum of a traffic accident. just sayin. Shawn Crosby, I totally agree with you! 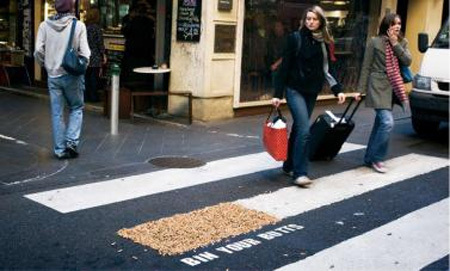 However, this is just an ingenius way to reach to even the most unattentive pedestrian. Gud job, we’ll sure adopt some in Kenya! I like the ‘real’ Zebra crossing from a zoo in South Africa. Very cool and real concept.